In this highly inventive take on Verne's classic, Passepartout (Chan) must make it to China in order to return a valuable jade Buddha that was stolen from his family's village. He seeks refuge with an eccentric London inventor, Phineas Fogg (Coogan), who puts his reputation, fortune, and career on the line in a daring bet to make it around the world in eighty days. Joining them is Monique (De France), a young French artist who decides that a trip around the world would provide new inspiration. Opposing the group is Lord Kelvin (Broadbent), who's wagered his position as head of the Royal Academy of Science against their journey's success. Their incredible adventure spans many colorful and exotic lands from historic London to Paris, Turkey, India, China, across the Great Seas, to a burgeoning United States, and more. 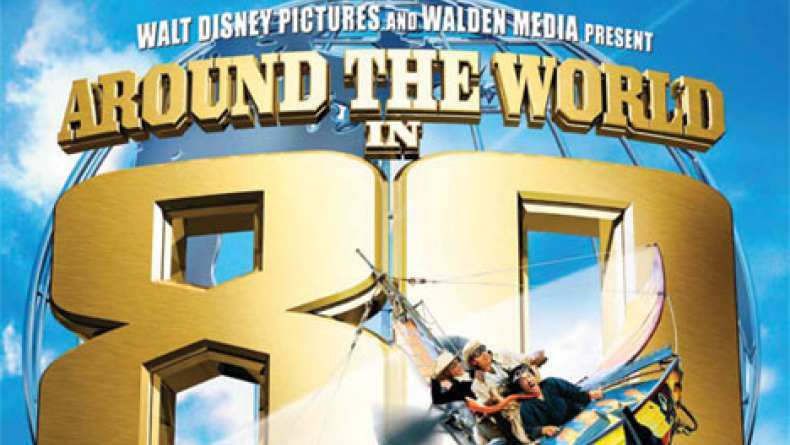 Along the way, the group encounters an eclectic assortment of characters including Queen Victoria (Bates), a Scotland Yard Sergeant (Cleese), a hot air balloon engineer (Branson), a Turkish Prince (Schwarzenegger), an eccentric inventor (Schneider), the Wright Brothers (Owen and Luke Wilson), and many other international star cameos.